>We’re laying down tracks for our upcoming CD using the multi track recording Apple Computer Program called “Garage Band”. 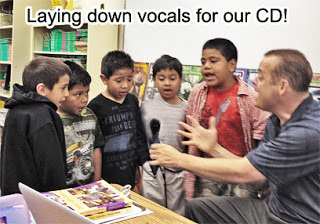 It’s great because the kids get to work in groups and listen to their recordings, and then decide if they want to do retakes and change the way they are using intonation, diction, phrasing, and volume. I got a pro drummer to lay down some drum and bass tracks and the rest of it is all us. Don’t think for a second that it won’t rock though; you will be plenty surprised at how awesome it sounds!.